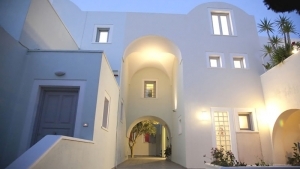 Kalisti Hotel & Suites is a 4 star hotel, located in Fira featuring air-conditioned rooms with private balcony. It offers an outdoor swimming pool with sun loungers terrace and an open-air hot tub. All rooms and suites are tastefully decorated and come with satellite TV with music channels and free Wi-Fi internet access. All with a private bathroom with a hairdryer, slippers and free toiletries. A minibar is available upon request. Pergola pool bar serves drinks, light snacks and cocktails, until late at night. 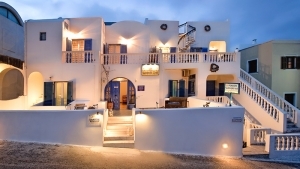 Rosemary Restaurant serves international cuisine and local Greek specialties. Wi-Fi is available free of charge in the business center as well. The hotel’s desk operates 24 hours and can arrange for car rental, ticket service, as well as port and airport transfer. Personalised services include massage sessions and in-house laundry and pressing. 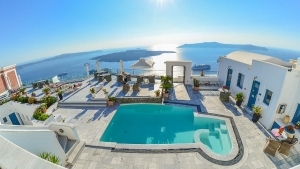 Hotel is located 6 km from Santorini airport and port of Athinios. 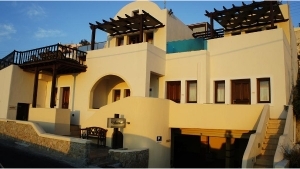 Restaurant, Bar, 24-Hour Front Desk, Garden, Terrace, Non-Smoking Rooms, Rooms/Facilities for Disabled Guests, Express Check-In/Check-Out, Safety Deposit Box, Chapel/Shrine, Heating, Luggage Storage, Air Conditioning, Designated Smoking Area, Snack Bar, Sun Terrace. Activities: Fishing, Massage, Table Tennis, Windsurfing, Library, Hiking, Cycling, Diving, Horse Riding, Outdoor Swimming Pool (seasonal). Services: Room Service, Meeting/Banquet Facilities, Babysitting/Child Services, Laundry, Ironing Service, Bridal Suite, Bicycle Rental, Car Hire, Tour Desk, Fax/Photocopying, Ticket Service, Private Check-in/-out, Shuttle Service (surcharge), Water Sports Facilities on site, Airport Shuttle (surcharge).